Yoga Nisarga Offers Yoga Teacher Training and Yoga Retreats in India, Thailand, and Bali. RYS 200 Yoga Alliance USA. Yoga mats, equipment, mat bags, accessories. 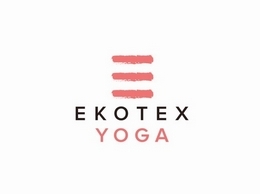 Supplier of choice for yoga studios, teachers and yoga practitioners throughout the UK and Europe. Eco-friendly & organic wherever possible. The Calm Space offers Pregnancy yoga, Yin yoga, postnatal and relaxation classes in Billericay, Essex, UK. Karen is a qualified midwife and mother offering yoga classes and parenting support for mothers and Yin and restorative yoga classes for everyone. 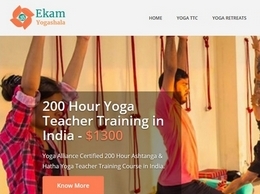 Ekam Yogashala is certified yoga school in India. School offers 200 hour yoga teacher training and yoga retreats in Rishikesh, India and in Nepal. 200 Hour Hatha Yoga Teacher Training in India at The Bodhi Center for Yoga and Meditation. Residential program based on authentic teachings of traditional Hatha System of Yoga. 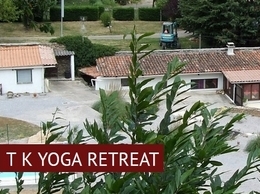 Our beautiful retreat venue for TKyoga is situated in the lovely languedoc region in an area of outstanding natural beauty. We specialize in quality yoga mats, yoga clothes, mat bags and accessories. From beginner to advanced, we have yoga products to suit all abilities. Buy with confidence from our online yoga shop. Yoga Teacher Training, India (Himalayas) and Croatia (Dolphin Island). The yoga training certification programs are accredited by Yoga Alliance. Yoga and meditation retreat holidays in India, Croatia and the UK. Ashtanga yoga is a system of yoga recorded by the sage Vamana Rishi in the Yoga Korunta, an ancient manuscript "said to contain lists of many different groupings of asanas, as well as highly original teachings on vinyasa, drishti, bandhas, mudras, and philosophy" (Jois 2002 xv). Your Online Retreat for Yoga Poses, Classes, Meditation, and Life—On and Off the Mat Namaste. Yoga classes in Billericay, Hutton, Brentwood and surrounds with an Ayurvedic feel working on asanas for the season and incorporating pranayama (breathing techniques) and relaxation in each class to calm you body and mind. YogaPressInc is Your Number 1 Yoga Accessory Reviews: Yoga Clothes, Yoga Towels, Yoga Balls, Yoga Mats among Others. We provide Unbiased reviews to help our clients choose the best product they desire for their Yoga Training's. Japa Mala Beads has been making and importing mala beads since 2004. Their unique malas are “designed by an artist and strung by a yogi.” Most of their beautiful mala beads are handmade in the USA. Firefly Yoga Is An Independent Yoga Studio In Cwmfelinfach, Caerphilly. We offer yoga classes for all levels of ability. Commutable from: Risca, Newbridge, Blackwood & Newport. We provide yoga teacher training and laughter yoga Leader training, yoga and meditation retreat, corporate yoga (corporate stress management solution), yoga and meditation workshops. Mahamukti Yoga school offers 200, 300 & 500 hour yoga teacher training in Rishikesh India Registered with Yoga Alliance USA - Ashtanga, Hatha & Vinyasa Flow. Immerse yourself with Yoga Teacher Training Courses in Rishikesh. Be a pro yoga trainer and lead as trainer. Rishikesh Yogis Yogshala is recognized by Yoga Alliance, USA and offering yoga teacher training & certification in Rishikesh, India. beYogi is a community of yoga practitioners and teachers with a common goal – to start living yogi. beYogi offers yoga teacher training tips, along with yoga related discounts and yoga teacher insurance. 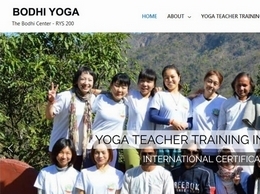 Yoga TTC In India: Om Yoga Rishikesh offers multi-style certified yoga courses in 100 hours, 200 hours and 300 hours yoga teacher training (beginners - advanced) Rishikesh, India. Becs McBride is a fully qualified Yoga & Meditation teacher offering classes & private tuition in Woodhouse Eaves, Loughborough. Are you yoga enthusiast? Looking for everything about yoga and retreat in Kerala, India? 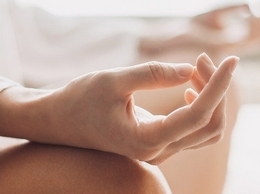 Visit our blog to learn more about yoga and Ayurveda. Happy reading! Aum Yogashala is one of premier Yoga schools in Gurgaon. It was started with a purpose to make a healthy and disease-free society. We offer various Yoga programs Daily Yoga classes, Corporate Yoga classes, Yoga therapy, Kids Yoga, Yoga Retreats, etc. Shwaasa offers a wide array of programs, such as daily yoga classes, weekend yoga classes, yoga teacher training course, a specialized course such as corporate yoga, yoga therapy, traditional yoga, etc. 200hrsyogattc is an organizer of premium yoga courses in India. It brings into focus Yoga Teacher Training courses being provided at exquisite locations full of peace and nature’s bliss, like Rishikesh, varkala .